Bloatware (aka crapware) is a general term, that refers to any kind of useless program, that simply takes place in your storage space/hard drive and consumes valuable resources from your device such as RAM memory, CPU usage, battery life etc., without giving you virtually anything useful in return. There are tenths of different types of bloatware and they are commonplace for probably all OS’s on the market. PC’s, laptops, smartphones and tablets alike are all potential carriers of such annoying software. In this specific article we will cover the main features of bloatware programs on Android (smartphones, tablets) and Windows (PC’s, laptops, phones). We will also provide you with guide on how to deal with those unwanted programs, so that they won’t needlessly slow-down your system. Android users are probably the ones that hate bloatware the most. It is easy to see why. 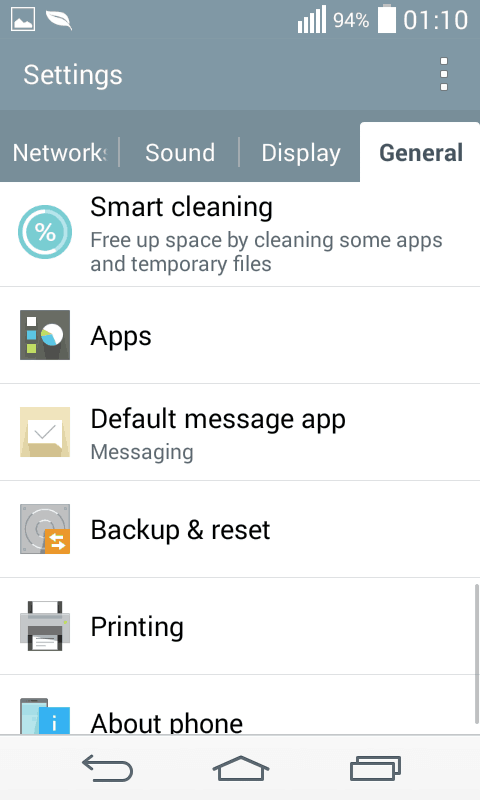 Not only is it almost obligatory to have several annoying, space consuming apps pre-installed on your new smartphone, but it can be also quite difficult to get rid of them. The thing with bloatware is that developers want to promote their other products and what better way to do so, than filling their newest model of smartphones with a bunch of random apps. Unfortunately, these app are often poorly programmed and in many cases useless or at least with much better alternatives, which the user would prefer, if given the choice. The worst part is that you are usually stuck with them – very often those apps can not be easily uninstalled. Even if they could, there’s a high chance that by uninstalling some of them, you may negatively affect your device’s performance: it may result in problems, make your system unstable or block your phone from getting updates. Furthermore, many of these apps cannot be obtained from the Google Store, so you won’t be able to get them back, should any problem occur due to their absence. Only a full OS restore will do the trick. However, there is some light in the tunnel. Recent android versions provide the option to disable (in other words freeze) apps you don’t need, but don’t want to uninstall either. This will keep these applications on your phone and they will still take place in your storage, but at least won’t eat-up other valuable resources. Keep in mind, that freezing those applications may also trigger unexpected errors, but unlike uninstalling them, now you will be able to quickly enable them again and fix the problem. If you happen to be using an older version of android or the app in question simply doesn’t have the disable feature, things become considerably more difficult. Still, there is a way to handle that too, but it may take some time. Just remember – it is advisable if you do not outright remove any of the pre-installed ads. As we already mentioned, this may lead to other problems, to which the presence of several unwanted apps is nothing in comparison. The variety of Bloatware programs for Windows user vastly surpasses the number of their counterparts for Android. They are so many and the ways for them to get on your PC are so different, that in order to list them we will need about ten extra articles. Instead, we will cover most general types of Windows bloatware and their most characteristic features.The term bloatware was originally coined for Android applications, but now also encompasses all kind of unwanted programs in Windows too – and of which there are plenty. These are usually pre-installed by the developers of the device (laptop, PC, windows smartphone). Sometimes they can be useful, other times they may prove to be useless bloat and often it all depends solely on your opinion about them. Usually the problem is not with the purpose of that program, but with how effective and well-made the actual program is, especially in comparison to their paid alternative, that you can buy online. However, many laptop and PC developers have signed contracts with third-party companies – they are getting paid for promoting those companies’ products via pre-installation. This in terms makes the final price of their computers lower and more affordable for the users, but in return they have to deal with the bloatware. Adware aren’t usually pre-installed on your PC. Their methods of distribution are different – usually through the internet, via bundling with free programs or by being sent to your email. The main goal of these programs is to flood your browser with various obstructive ads, that you can’t get rid of. Adwares are annoying and intrusive and while you may still find some basic use in some pre-installed utility programs, make no mistake, adware programs are almost always perfectly useless and may even expose your system to certain risks (though this happens somewhat rarely). Trailwares are programs, that you can use for free for a limited period of time – trail period. After that, if you still want to use the program, you will have to pay for it. Some users my even buy those programs, if they consider them useful. If not, their removal is quite easy – you simply have to uninstall them. The thing about them is that if the trail period has finished and you do not pay for the full version, the program will usually become useless and will only take space on your hard-drive and/or hassle you with constant prompts to update it. Also you may expect this can get quite annoying. So if you don’t consider paying for it, you’d better have it removed. In the intro, we already mentioned some of the basics steps, that need to be taken, when you want to decrease the unwanted effects, that pre-installed apps have on your device. In this guide we will elaborate on that and show you the do’s and don’ts of the process. 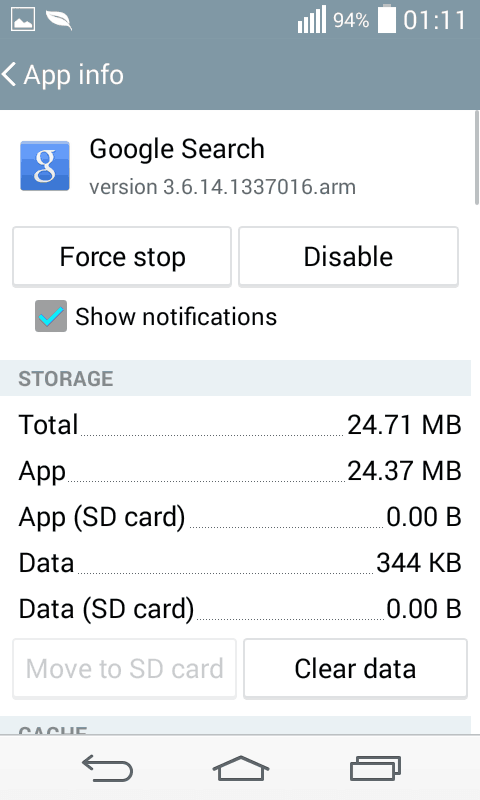 As said earlier, newer Android versions enable the user to freeze apps, that they don’t need. This makes the whole thing a lot easier and simpler. Note that, the application itself needs to have such setting as well, else it won’t matter what version of Android you’re using. Now, what you need to do is go to Settings>General>Apps>All. Here you can see all apps, that have been installed on your device. Single out the ones, that you want to disable and simply tap on them. In my case I’ve tapped on the Google Search application simply as an example. 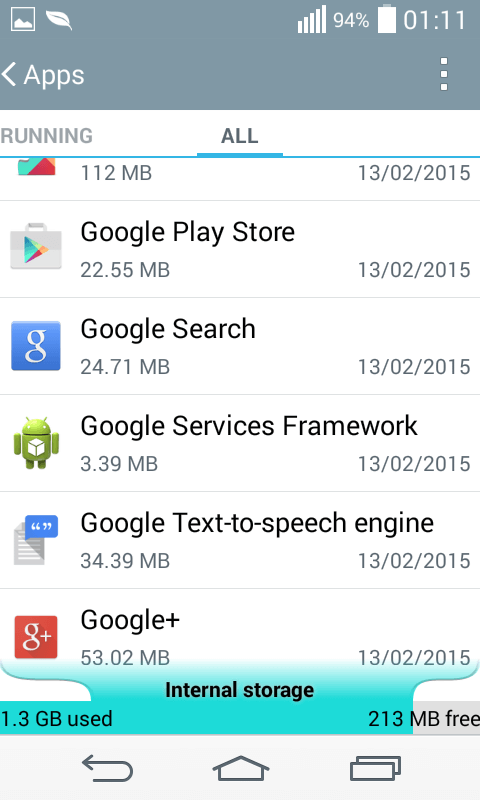 Google Search is not bloatware. Once you do that, you will be able to see some detailed information about the chosen app and also several different settings. The one we are interested in is Disable. Tap on it and you will be asked whether you are sure, that you want to have the application disabled. 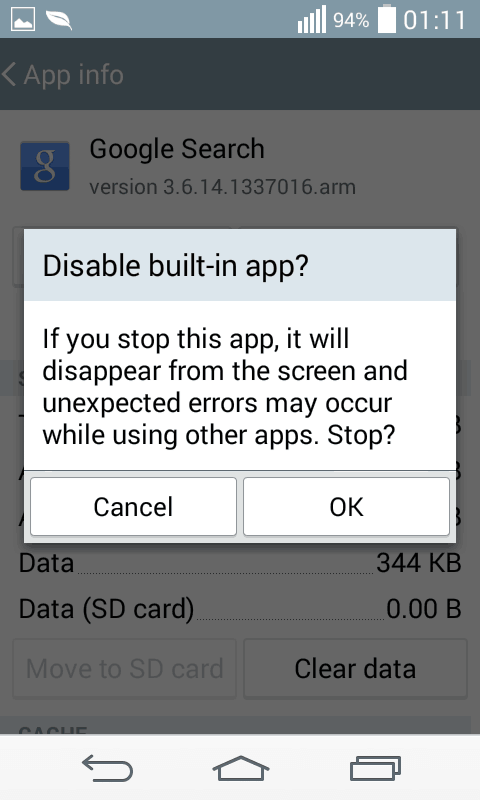 You are warned, that disabling it may lead to unexpected errors with other apps. This is still a preferable alternative to the outright uninstallation. Press OK. After disabling the app, you may also want tap on force stop and clear data, just in case there’s something left behind. This will also cause your phone to free memory that was reserved for the app. The actual difficulty is when, for whatever reason, you don’t have the disable button. If that is the case, you will need to root your device. Rooting an Android device is similar to gaining Administrator rights on a device, that uses Windows OS. Once you’ve done so, you have full access to all settings and can alter them at will. This root account, however, is not supposed to be accessed by regular users and there’s no built-in way to do so. There are different reasons for that, but we won’t into detail here. Just know, that some of the reasons are concerning the normal working process of your Android device and its security, so keep that in mind. There are several ways to root your device. However, it is not very advisable to do it, unless you have a pretty good reason. Therefore, first consider whether a bunch of annoying aps are really worth it. Rooting you phone is like entering through the maintenance hatch – you have access to virtually everything on your phone, but if you don’t know what you are doing you may also cause a lot of damage. Be very careful if you decide to root your device. Once having rooted your device, you will probably need an extra tool to aid you with the disabling/uninstallation of the unwanted apps. Fortunately there are quite a few of them in the google store that will get the job done for free. No matter how many bloatware programs are out there for Windows, there’s basically one universal way to get rid of them all. However, sometimes there might be some of them, which might require more time and effort in order to be removed. Fortunately, most of the time, this is not the case and you can safely rely on that single and very effective method. 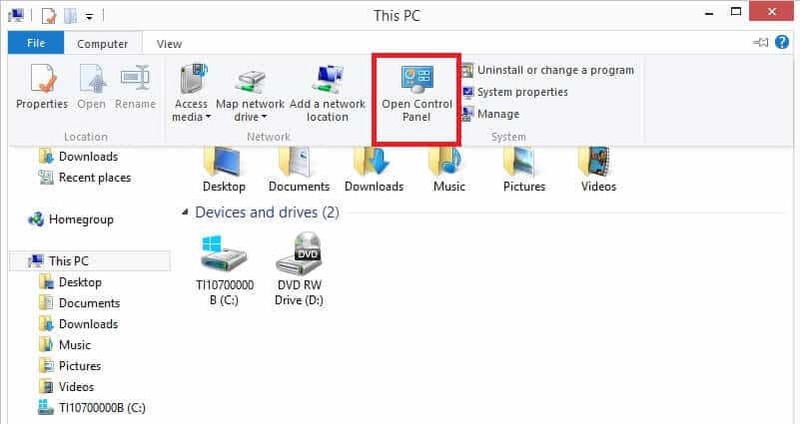 Unlike the lack of built-in way to access the root account on an Android device, most Windows users should have Administrator rights on their machine by default, which makes it that much easier to deal with any unwanted software. 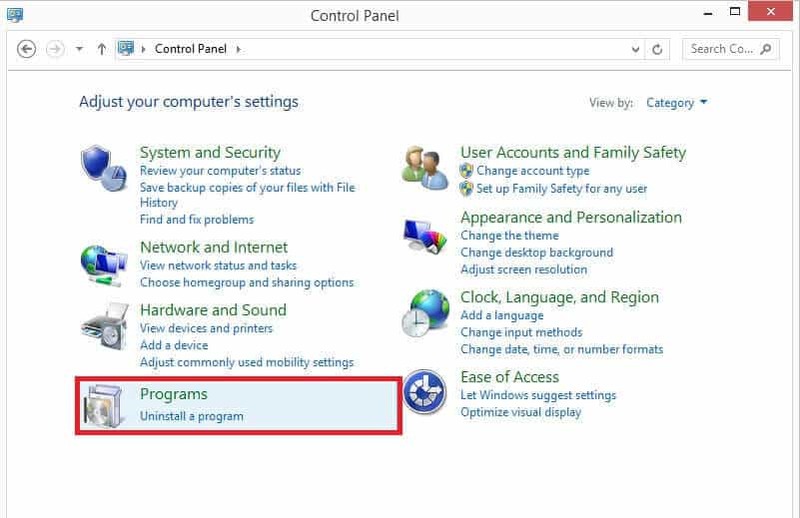 All you have to do, in order to remove the programs you don’t want, is to access the Control Panel and then go to Programs > Uninstall a program. 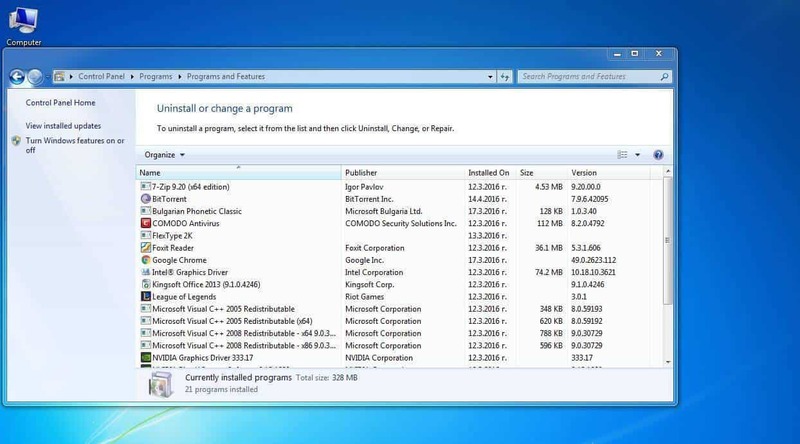 Then single out the unwanted program from the list and simply click Uninstall. In the majority of cases this should be all, that you need to do so as to get rid of the unwanted bloatware.